Lara was chosen out of thousands as one of the 100 everyday amazing people changing the way we experience cancer. The nomination was initiated by Esther, a scarf recipient and subsequent scarf & story donor from New York. Esther attended the gala event in Boston with Lara to celebrate! You can read Lara’s nomination and learn more about the award HERE. Jay and I spent the last couple days in Boston to accept an award called The one hundred. It was an amazing whirlwind of a trip. First of all, Jay travels every week for his job, so when he is home we intensely focus on family time. Having this time together was great. He always jokes that I bring him along to take pictures and hold my phone. The truth is I couldn’t do any of this without him. When we first arrived in Boston we walked to a little deli grocery and picked out delicious items for a picnic. Sitting in the Public Garden, a young woman wearing a scarf sat down beside us with friends. I looked at Jay with a smile. I had to go give her a hug. After introducing myself I learned she had just come from her last radiation appointment and had several more rounds of chemo for Ewing Sarcoma. The look in her young eyes was so familiar to me. We talked about what it’s like to live in this alternative reality of cancer treatment in your 30s. We hugged as I encouraged her to take it one day at a time. I hope she will request a Hope Scarf. I know exactly which scarf and story to send to her. Jessica’s. On Wednesday Jay and I started the day with a run through The Public Garden and along Charles River, dodging raindrops. 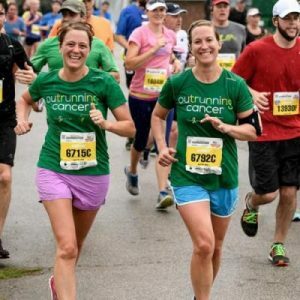 We recalled some of our favorite runs: exploring Brisbane, Australia, getting lost in Seattle, trail running inAustria and our first visit to Boston when Jay ran the Boston Marathon. Thankful to be running strong together after all we’ve endured. We stayed at a great little boutique hotel, The Nine Zero.Who treated us to champagne in our room after learning about the award we were there to receive! They also had bikes for guests to borrow. So we decided to bike to MIT for our meeting with the Broad Institute. Not every day you just bike over to Harvard for a meeting! This visit will have a blog post all it’s own. But, in a nutshell Corrie, Elana and everyone working on the MBC Project are awesome. It was unbelievable to sit down with them face to face and learn about the Metastatic Breast Cancer Project. A dynamic new initiative to gather tumor samples, DNA and medical records on metastatic breast cancer patients to speed the development of future therapies. I wanted to personally thank Corrie for her work and talk specifics about how I can help. I have already shared my DNA and I am excited to play at active role in this meaningful work. Selfless science – with the potential to transform our understanding of metastatic breast cancer… Hope. Jay and I topped off our bike ride with a stop at Faneuil Hall for a lobster roll and chowda. I left The Broad Institute excited and encouraged, but also incredibly overwhelmed with the way we as a species are addressing cancer. We need more people who think like The Broad Institute– sharing information & working in collaboration with the end goal of helping patients. Not publishing a paper. Needless to say, Jay and I had lots to talk about over our pint at the pub. And, as if THAT wasn’t enough – our day culminated with The one hundred Gala. 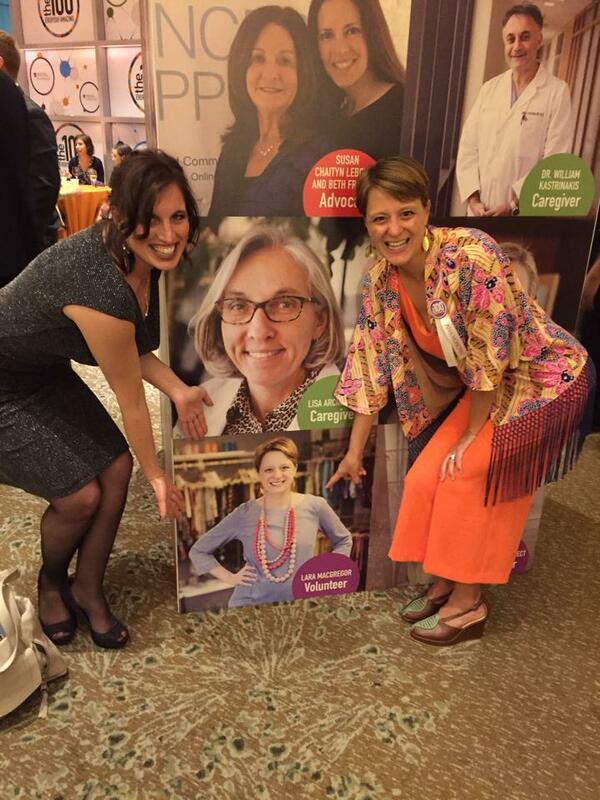 Celebrating 100 everyday amazing people changing the way we experience cancer. This event, put on by Mass General Cancer Center is a celebration like none I have seen. Cancer is an ugly, awful disease. But, the one hundred brought together 100 of the most dedicated creative caregivers, researchers, advocates,philanthropists, survivors and more for a beautiful evening celebrating the power of the human spirit to shine brighter than this awful disease. I was touched to be one of the honorees. But, even more so, I was honored to have been nominated by one of our scarf recipients from New York. Esther received a Hope Scarf as a gift from her son’s Spanish teacher two years ago. This simple gift was a big inspiration to her and she has since shared her story and passed along several scarves to other women through HopeScarves. She is an Ambassador spreading Hope Scarves in her community and I am thankful to also call her a friend. We hadn’t met in person until last night at the one hundred! She drove 7 hours to join us for the gala and it wouldn’t have been the same without her. We also had the chance to connect with other people doing amazing things – such as Holly and Bree of The Magic Yarn Program in Alaska and a karate program from Southfield Michigan that helps kids find power, peace & purpose through Kids Kicking Cancer. Dr. Jill Biden opened up the evening with her personal story of cancer and her big dreams for the Moonshot project lead by her husband Vice President Joe Biden. Each of the stories shared were inspirational. Tears flowed freely. I am hopeful new partnerships will emerge for Hope Scarves through connections made at the event. We are all facing the same beast –with our own creative way of helping. The human spirit will prevail in the midst of darkness. Everyday of this trip was amazing. I feel like it cracked open a new door of possibility for me and for Hope Scarves. I’m excited to continue our efforts to support translational, collaborative research. Those at the one hundred who got the attention of Dr. Biden or had their projects go viral on social media inspired me. I want to learn from them to see how Hope Scarves can do the same. We are knocking at the door of possibility. I’m ready to step out into the world in a big way to share my story, the hope scarves story and support research. I want to do this in every possible way I can while I am feeling strong. Moments in life when you take a deep breathe and give thanks. That’s where I am right now. Nostalgic this experience is over so quickly. Excited to see where we go next. Celebrate hope. Inspire action. Change how we fight cancer. 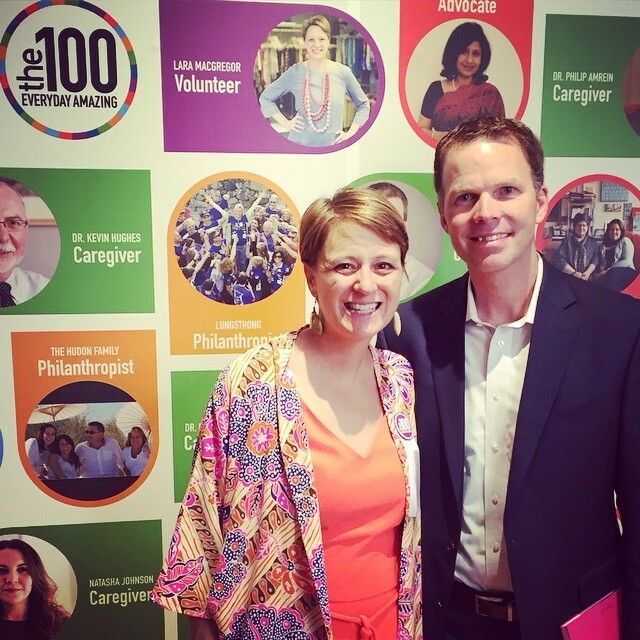 Lara MacGregor was chosen as one of the one hundred people changing the way we fight cancer by Mass General Hospital in Boston Massachusetts. 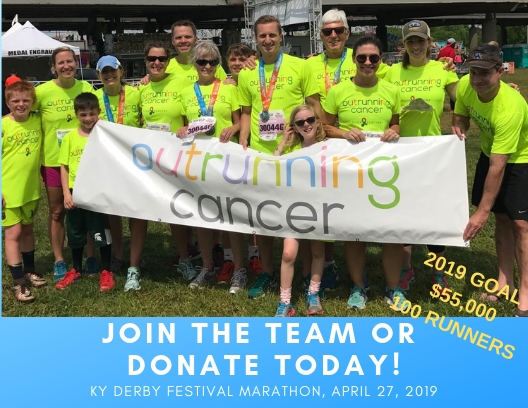 Every spring Hope Scarves has a team in the Kentucky Derby miniMarathon & Marathon. This year we partnered with Twisted Pink to raise even more money and engage runners supporting both organizations! 136 brave souls took to the streets on Saturday in sloppy wet conditions, bu t that didn’t stop us! We raised $67,279 to support people facing cancer and stage iv breast cancer research! A quick recap of some of my favorite memories. Dan Bayer’s team was neck and neck with my college friends on the “Go Hope” team for top fundraiser. A highly anticipated bet from last year was renegotiated to bragging rights (thank goodness!) as the two teams agreed- one team. one goal. We announced at the Pasta Dinner that Dan’s team clenched the prize with a grand total of $15,900. However, the Go Hope! 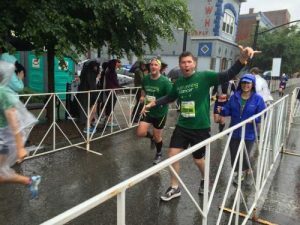 team pushed hard to raise money throughout the run ending up with a grand total of $17,036 as they crossed the finish line. We love this competitive spirit and dedication to supporting Hope Scarves. The support from these friends to raise so much money blows me away. My parents surprised me at the Pasta Dinner by presenting 600 handmade scarves from volunteers in my hometown and the potential of a $12,000 grant to Hope Scarves! Plus, their team, made up of my mom & dad, Eric, Kristin and Anne Sanders aka “Leggin’ it for Lara” raised $11,150! Race day started with clouds, but soon progressed to a steady downpour. Yet, runner after runner crossed the finish line with a huge smile. Despite our soaked clothes, and chattering teeth… our spirits could not be dampened! Our green shirts were everywhere! 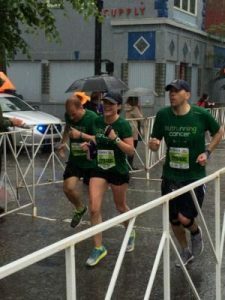 Big thanks to Trak Shak and Brooks running for our awesome bright green shirts – we stood out and could spot each other to cheer encouragement! I heard spectators yell, “Go outrunning cancer!” It was great! Our scream team cheered on the runners with great enthusiasm – rain schmain! They were just the boost I needed at mile 11! ch as they try they can’t live as full of a life as they wish. The joy in my heart is always tempered by this reality. I wasn’t just running for just me on Sat. I was running for all of us. fans and saw the finish line I wished so badly I could run up and down that stretch over and over again (but my knees were glad to stop). If those spectators knew how much those final steps meant for me and all women facing metastatic breast cancer. If they knew how badly I just wanted to be a healthy cancer free survivor who beat cancer… not someone who was due back for an injection the following week and had just had a PET scan days before. I did it. I outran cancer. It didn’t win. I won. 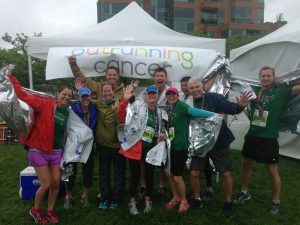 Today – I outran cancer. WE outran cancer. I ran for those who can’t. For my friends I have lost to this awful disease. I ran so that one day someone with metastatic breast cancer will have better odds at survival. 137 team mates completed this race for sisters, moms, wives, friends, strangers. We ran to raise money for metastatic breast cancer research and support those facing cancer. 607 people donated to support our efforts! If you’d like to support outrunning cancer you still can by clicking HERE. Miles to go… but closer with each step.